The Two Female Leaders Who Have To Figure Out The Brexit : Parallels Britain's new prime minister, Theresa May, and German Chancellor Angela Merkel have a mammoth task ahead: overcoming their differences over how to handle Britain's departure from the EU. German Chancellor Angela Merkel (right), and British Prime Minister Theresa May (left), listen to translations during a joint news conference in Berlin on July 20. They are the two most important figures in the negotiations over Britain's departure from the European Union, the so-called Brexit. The biggest challenge facing Britain's new Prime Minister Theresa May is extricating her country from the European Union. And the most influential European leader she'll have to negotiate with is German Chancellor Angela Merkel. The German media have wasted no time in calling May the "British Merkel," and drawing comparisons between the two women. Both rose to power within their respective conservative parties to the surprise of their male colleagues. Both are seen as tough yet pragmatic negotiators who steer clear of political intrigue and gossip. Commentators attribute Merkel's and May's discipline and work ethics to the fact that their fathers were both pastors. The comparisons have also delved into the trivial, from their love of cooking to their sartorial choices. "The obsession with May's shoes, or that she has a nice husband who is prepared to fade into the background, or that, like Merkel, she has no children. These things are not relevant, they're simply condescending," says Anja Maier, parliamentary correspondent for the German daily, Die Tageszeitung. "I think there is a deep-rooted fear of female leaders, who are still a rarity in this world and somewhat novel, and this fear spawns disparaging remarks," she adds. But when May traveled to Berlin last Wednesday to meet Merkel, the focus began to turn to their political differences and how this could affect the messy business of implementing Britain's EU withdrawal, the so-called Brexit. Alan Crawford, co-author of a biography on Merkel, foresees friction. "Their fundamental views are polar opposites in that the chancellor is a very committed European and I certainly detect that there's a lack of understanding as to what Britain is doing," he said. "At the same time, Merkel has said that they have to accept the fact that Britain has voted this way and so she'll deal with it, but that's where the tension will start to appear," he added. At their joint news conference, May talked of "controlling immigration from the EU into the U.K." But Merkel dodged the issue by insisting Britain must invoke Article 50 – the official trigger to start divorce proceedings – before official negotiations can begin. "We will wait to hear what Britain wants, then we'll issue a response. Right now, there's no point in 27 member states saying 'if they do this, we'll do that.' That will only destabilize Europe," Merkel said. For Germany and the other EU member states, freedom of movement for EU citizens is sacrosanct. 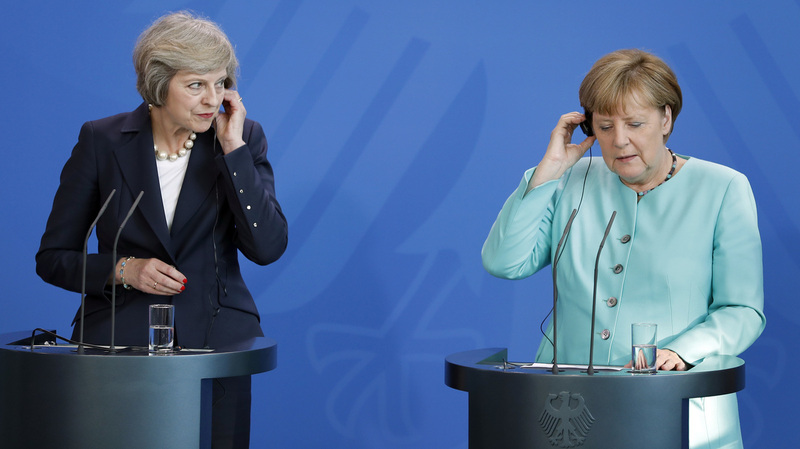 But it was clear May was eager to strike a cordial tone with Merkel. The British leader promised that the Brexit will not mean "walking away from Europe" and that Britain will remain outward-looking. "I think what is very important is that we have two women here who, if I may say so, get on with the job and want to deliver the best possible results for the people of the UK and the people of Germany," May said. Merkel appeared receptive to May's outline, and responded by saying she that she endorses those sentiments "wholeheartedly." Merkel also signaled that she supports May's intention not to trigger Article 50, and thereby launch the negotiations, before 2017. Having bought some more time, both leaders conveniently have the summer recess to ponder how their new relationship will develop.